What is Carbon Nanotube Synthesis? « What Are The Physical Properties Of Carbon Nanotubes? What is Carbon Nanotube Synthesis, and What are its Implications for Modern Science? While the mystery and implications for science surrounding carbon nanotubes in modern science have gained them immense popularity with scientists and researchers in myriad fields. The age old question –what is carbon nanotube synthesis? is quickly gaining ground in modern science as well. And its implications may far outweigh and outreach those of just carbon nanotubes, since this process of synthesis may very well open doors for science and for the use of carbon nanotubes that no one ever thought possible. Carbon nanotubes are essentially constructed of a lattice work sheet of graphite that is rolled into a cylindrical shape. These carbon nanotubes are feather light in their construction and much stronger than many other properties used in not only nanotechnology but also in electronics, optics, additional areas of materials science, architecture and even the construction of motor vehicles, space vehicles and other materials useful in a wide array of traditional fields of research and modern living. Carbon nanotubes are also known to have any unique electrical properties and have even been tested and proven as super efficient conductors of heat, otherwise referred to as thermal conductors. It is only their potential to have some toxic properties that has limited their widespread use and distribution for construction and other purposes. Carbon nanotubes come in a variety of forms, including single walled carbon nanotubes, double walled carbon nanotubes and multi walled carbon nanotubes. Each type of carbon nanotubes has its own set of unique properties that make it useful for different areas of science. For instance, the single walled carbon nanotube has especially strong electric properties that the other varieties lack. Carbon nanotube synthesis is incredibly important to the research of the potential uses of carbon nanotubes because nanotube synthesis is the method of production used to create carbon nanotubes. The faster the rate of synthesis, or production, the more carbon nanotubes available for researches and scientists to use in testing for the various possible uses of carbon nanotubes in standard modern day living, current science and potential future applications. Although carbon nanotube synthesis can occur naturally through flame synthesis, the most common methods of used in modern science include laser ablation, arc discharge and chemical vapor deposition. The arc discharge method of nanotube synthesis was initially developed by accident. In 1991, an arc discharge that was meant for producing fullerenes, produced, along with the fullerenes, carbon nanotubes. In 1992, the experiment was reproduced by two researchers at the Fundamental Research Laboratory of the NEC. This process involves high temperatures for discharge which cause the negative electrode in the arc to force sublimate the carbon nanotubes contained within. Additionally, this process has a yield by weight of more than 30 percent and it is able to produce both multi walled (including double walled) and single walled carbon nanotubes. This method for carbon nanotube synthesis is most popular because it was the first method discovered and used. The carbon nanotubes produced through this method of synthesis often have few defects, if any, and lengths of more than 50 micrometers are able to be produced. But arc discharge is not the only type of nanotube synthesis available to researchers and scientists. Other methods have been developed in order to provide a wide variety of acceptable outcomes—acceptable outcomes being defined as producing usable carbon nanotubes in large quantities with minimal defects. One of the additional methods of nanotube synthesis is laser ablation method. When scientists use laser ablation synthesis method for carbon nanotubes, both a pulsing laser and an inert gas are paired together in a tightly sealed reactor with high temperatures. The pulsed laser is used to vaporize the graphite as the gas is allowed to slowly seep into the reactor chamber. The graphite vapor condenses as the reactor surfaces of the chamber cool down and nanotubes form out of the vapors. In the laser ablation method, scientists most often produce single walled carbon nanotubes and the yield is approximately 70 percent by weight. Although this method yields much more by weight than the other two available methods, it is much more expensive to use and many scientists and researchers opt in favor of the less expensive methods. The final popular method of carbon nanotube synthesis is the chemical vapor desposition method. Although this method has been used to synthesize carbon since 1959, the chemical catalytic vapor deposition method of producing carbon nanotubes was not first used until 1993, nearly forty years after its first use for synthesis and two years after the first nanotubes were synthesized using the arc discharge method. This method was further developed in 2007 by University of Cincinnati researchers and at that time began producing carbon nanotubes at lengths of 18 millimeters, much longer than those produced by the arc discharge method at only fifty micrometers. In chemical vapor desposition, a substrate made of iron, cobalt, nickel or a combination of any of these metals is heated to precisely 700 degrees Celsius inside a chemical reactor. Process gases such as hydrogen, nitrogen or ammonia along with a carbon gas like methane, ethanol or acetylene, is leaked into the reactor chamber. The meeting of the gases at the substrate cause a reaction that breaks the carbon gases apart and forces the particles to the sides of the chamber, where the carbon nanotubes are formed. This method of nanotube synthesis is the most popular for commercial production because it allows for nanotubes to be grown from and on a specified substrate. The most important factors relating to nanotube synthesis are how fast the nanotubes can be grown, how many can be made at any one time, how much the process to be used will cost and most importantly, how few structural defects will be present in the new carbon nanotubes that have been synthesized. All of these factors determine the future of carbon nanotubes and the development of better method for synthesis will determine the future application of carbon nanotubes in everything that surrounds us. 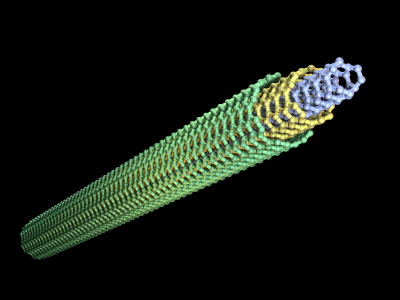 This entry was posted on October 24, 2009, 11:47 am and is filed under nanotubes. You can follow any responses to this entry through RSS 2.0. You can leave a response, or trackback from your own site.